Arc System Works rethinks the basics of fighting games. Fans of one of the biggest names in all of anime have been somewhat underserved by videogames, in quality if not in quantity. Licence holder Bandai Namco churns out tie-in games at a right old lick, but they’ve always felt like cash-ins: products that sell because of the name on the box, rather than what’s inside. Well, no longer. 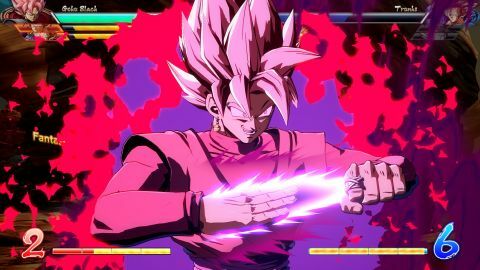 Not only is Dragon Ball FighterZ comfortably the best game this licence has ever produced, it’s a cracking fighting game, too. It is also a gorgeous one, a far cry from the rough edges of Dragon Ball games past. Developers Arc System Works make the Guilty Gear Xrd games, and the game engine that underpins what was, until now, the most beautiful fighting game on the market is a perfect foundation for what is to all intents and purposes a fully playable cartoon. Arc’s genius lies in the fact that, despite the side-on view, these are 3D character models battling it out on 3D stages, meaning the camera can be unhooked from its moorings at any time to better frame a powerful move or super combo. The result is a sumptuous-looking game before a fireball has even been thrown in anger. Once the sparks do start to fly, it is simply something else, the screen exploding in anime-perfect carnage. Such visual spectacle isn’t exactly uncommon in fighting games, and particularly in team-based brawlers. But rarely has such devastation been so easy to pull off. Mindful of the fact that the Dragon Ball licence will bring in a more casual audience than their games typically attract, Arc have lowered the barrier to entry with a host of systems aimed at the beginner player. Special moves are performed with simple quarter circles and one button. The same applies to super moves, albeit with either a double-button press or, on a controller, a single trigger. They’re universal across the cast, too—each motion will produce a different result in each character, but the idea is that you can hop around the cast at will without needing to pore over pause-menu move lists. Other system-wide concessions include auto-combos, performed with rapid presses of light or medium attack (the former including a flashy air combo, the latter ending in a super move); a Super Dash, which homes in on your opponent from anywhere on screen; and the Vanish, which teleports you behind your opponent and whacks them away. Yet nowhere is Arc’s drive for accessibility more apparent than in its implementation of the humble fireball. Projectiles are an essential tool in fighting games, vital for controlling the space in front of you, forcing an opponent onto the back foot or into making a mistake. Here, they’re called Ki Blasts, and are performed with a single button press. Mash the button, and you’ll fling out a long string of them. Add a fireball motion, and you’ll fill half the screen with a Kamehameha. With an anti-air Shoryuken available to anyone who can press down and heavy attack, novice players have easy access to all the fundamental tools. If your impression of all this is one of a game aimed at, and solely at, people who wouldn’t know a super cancel if it smacked them in the face, think again. As you’ll discover once you clear the generous, if insultingly easy, Story mode, and either take on the upper tiers of Arcade mode or head online, this is a game of tremendous complexity. The moves may be easy, but working them into a team of three, finding synergy in assists and supers, is anything but. The CPU AI suddenly turns into a monster with a few dozen tournament wins under its belt, while the online competition is stiff indeed. The game does a wonderful job of easing you in, but a pasting, whether you venture online or not, is as good as inevitable. If only the online component had launched in a slightly better state: network conditions are spotty at best, and you’ll frequently be kicked out of the online lobbies you’re automatically loaded in to when you boot up the game (yes, even if you want to play single-player modes). No doubt it will be fixed—these things usually are, and perhaps Namco were caught on the hop by the game’s success (it is already the most popular fighting game in Steam's history). But it shouldn’t have happened in the first place. There’s disappointment, too, in the lack of any kind of bridge between the easy button mashing of the Story modes and the lofty complexity of the high-level game. But this is a genre-wide problem, and one Arc and Bandai Namco never set out to solve. Their mission was to make a fighting game that was true to its licence, and appealed both to anime-loving beginners and genre veterans. On that measure, it has succeeded, and with style. Check out some in-depth information on the graphics settings, keybindings and other elements of Dragon Ball FighterZ here.